The Known Effects of Lightning on the Body is a contemplative video installation and a space for quiet reflection. 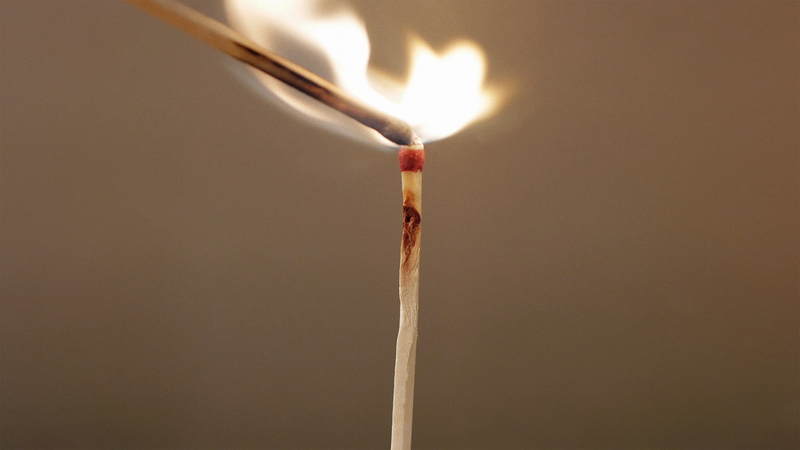 Vicarious bodies (match sticks) are ignited in succession, anthropomorphizing as they burn. Moments of contact between bodies quickly shift into moments of crisisthe physio-chemical crisis standing in, perhaps, for psycho-biological criseswhich in turn cool themselves into processes of gradual exhaustion and relinquishment; the match-body bows, as it were, as it is consumed. The Known Effects of Lightning on the Body was created as an exercise in attention and attenuation. While mortality, impermanence, and the confluence of the bodily and the metaphysical continue to be the major themes and primary areas of research of Henderson’s work, he is also interested in how we deal with these universal themes both individually and collectively. He explores human reactions to the inevitability of death and the search for transcendence; intrigued by the ways in which we accept, deny, or evade the knowledge of our own eventual and certain non-being. Thus, art becomes a delivery mechanism for philosophy, capable of removing the false problem of the terminus, the final point we spend our conscious lives avoiding. It is a practice marked by the persistence of collective histories and the brevity of individual lives. LEE HENDERSON is a media-based artist from Saskatchewan. He has studied art in Canada and Germany, with talented professionals including Maria Vedder, Brian Eno, and Ellen Bromberg. Since completing his MFA in 2005 at the University of Regina, he has been furthering his time – and lens – based artistic practice. Recent and upcoming exhibitions and screenings include the Zero Film Festival (Los Angeles), The Dunlop Art Gallery (Regina), The Mendel Art Gallery (Saskatoon), The Rooms (St. John’s), gallerywest (Toronto), and Kunstraum Tapir (Berlin). Henderson currently lives and works in Toronto where he teaches photography and media art at OCADU and Ryerson University. Read Lee Henderson: The Known Effects of Lightning on the Body by JENNIFER MATOTEK, an essay published along side LEE HENDERSONS exhibition.